alaTest has collected and analyzed 154 reviews of Sony HDR-AS30V. The average rating for this product is 4.0/5, compared to an average rating of 4.1/5 for other Camcorders for all reviews. People really like the color. The battery also gets good views. We analyzed user and expert ratings, product age and more factors. 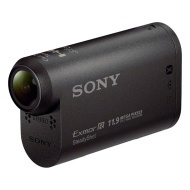 Compared to other Camcorders the Sony HDR-AS30V is awarded an overall alaScore™ of 90/100 = Excellent quality. Buyer beware, does not work well with HDRAS100! It holds the camera securely in place and the LCD is a nice feature, but there is no room for microphone use with the cradle. If you want to use the camera with a mic you must remove it from the cradle, super poor planning. The cradle works will with the camera and allows quick viewing vs sending the files via WiFi. If the cradle had a socket that allowed for charging the camera could be used with a constant power supply vs changing of the battery.